Oncogene, 2016, 35(31):4036-47. TPCA-1 purchased from Selleck. AGS cells were treated with cwith IL-1β in the presence of the IKK inhibitor TPCA-1, the p38 MAPK inhibitor BIX02188 and the JNK inhibitor SP600125. Cell lysates were obtained 24 h after IL-1β treatment and immunoblotted with PTEN antibodies. Mol Cancer 2014 13, 40. TPCA-1 purchased from Selleck. Quantitative real-time PCR of miRNA or mRNA expression in fetal human astrocyte cultures. TPCA-1 decreased both miR146a and miR147b expression. Glia, 2018, 66(5):1082-1097. TPCA-1 purchased from Selleck. (D and E) quantitative real-time PCR for the transcript expression levels of NLRP3 and IL-1b in NP cells induced by AGEs-BSA for 48 hrs, single or combined with RAGE-Ab or TPCA-1. Data were presented as mean ± S.D. (n = 3). *P < 0.05 versus control, #P < 0.05 versus AGEs-BSA. J Cell Mol Med, 2017, 21(7):1373-1387. TPCA-1 purchased from Selleck. 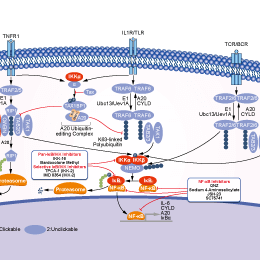 Requirement of IKK activation for insulin-dependent induction of IL-1 in U937 macrophages. U937 cells were pretreated with 1 μM PD-98059 or 5 μM 2-[(aminocarbonyl)amino]-5-(4-fluorophenyl)-3-thiophenecarboxamide (TPCA-1) for 90 min and subsequently stimulated with 100 nM insulin for 24 h. IL-1 mRNA was quantified as detailed in the legend to Fig. 1. Values are means ± SE of the no. of experiments indicated. Statistics: Student's t-test for unpaired samples and (where appropriate) 2-way ANOVA with Tukey's test for multiple comparison. *P < 0.05. Am J Physiol Endocrinol Metab, 2016, 310(11):E938-46. TPCA-1 purchased from Selleck. Honokiol regulated the expression of PTX3 and inflammatory response in PA-induced HUVECs model. PTX-3 levels from the enzyme-linked immunosorbent assay (ELISA) in HUVECs after treatment with vehicle, 0.5 mM PA, PA plus 10 μM honokiol or PA plus an inhibitor of IKK-2 (TPCA-1, 30 μM) for 48 h.
Exp Mol Med, 2015, 10.1038/emm.2015.37. TPCA-1 purchased from Selleck. Recombinant human IKK-2 (residues 1-756) is expressed in baculovirus as an N-terminal GST-tagged fusion protein, and its activity is assessed using a time-resolved fluorescence resonance energy transfer assay. In brief, IKK-2 (5 nM final) diluted in assay buffer (50 mM HEPES, 10 mM MgCl2, 1 mM CHAPS, pH 7.4, with 1 mM DTT and 0.01% w/v BSA) is added to wells containing various concentrations of compound or dimethyl sulfoxide (DMSO) vehicle (3% final). The reaction is initiated by the addition of GST-IκBα substrate (25 nM final)/ATP (1 μM final), in a total volume of 30 μL. The reaction is incubated for 30 min at room temperature, then terminated by the addition of 15 μL of 50 mM EDTA. Detection reagent (15 μL) in buffer (100 mM HEPES, pH 7.4, 150 mM NaCl, and 0.1% w/v BSA) containing antiphosphoserine- IκBα-32/36 monoclonal antibody 12C2, labeled with W-1024 europium chelate, and an allophycocyanin-labeled anti-GST antibody is added, and the reaction is further incubated for 60 min at room temperature. The degree of phosphorylation of GST- IκBαis measured as a ratio of specific 665-nm energy transfer signal to reference europium 620-nm signal, using a Packard Discovery plate reader. Method: Ten microliters of 3-(4,5-Dimethylthiazol-2-yl)-2,5-diphenyltetrazolium bromide (MTT) from stock solution (10 mg/mL) is added to each well of 96-well plates containing glioma cells and incubated at 37 °C for 2–4 h. Oxidized MTT is solubilized by adding 100 μL of 10% sodium dodecyl sulfate (SDS) in 0.01 N HCL, and plates are incubated at 37 °C for 4 h in a humidified chamber. Plates are read at 570 nm on a plate reader. Administration: Administered via i.p. or b.i.d. Podolin PL, et al, J Pharmacol Exp Ther, 2005, 312(1), 373-381. Du Z, et al, J Interferon Cytokine Res, 2012, 32(8), 368-377. 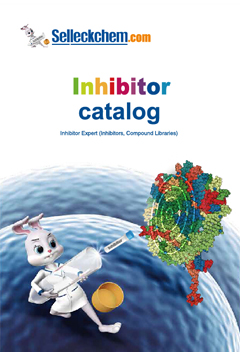 BAY 11-7082 : NF-κB inhibitor, inhibits TNFα-induced IκBα phosphorylation with IC50 of 10 μM.